Day 7: Waterford. Though Waterford is Ireland's oldest city with a rich history dating back to a Viking settlement established in 853, beyond the national borders the city's name is synonymous with its most famous product—Waterford Crystal. After moving to a hotel in town this morning and finding a delicious and healthy lunch at the Granary Cafe, we walked over to the House of Waterford facility for a factory tour. Having laid out our €10 senior admission and picked up tickets, we decided use the half hour before our tour began to explore nearby Christ Church Cathedral. 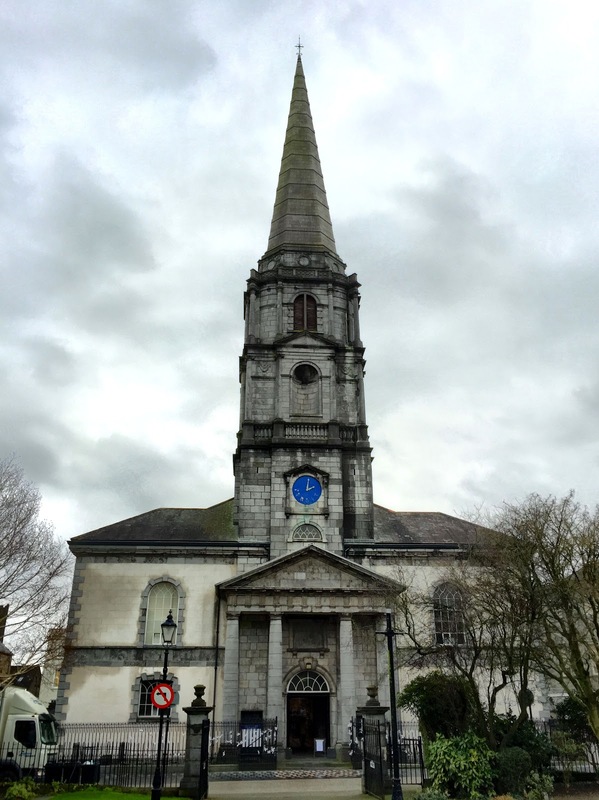 A Catholic church was first built on this spot in the 11th century, replaced in 1210 by a cathedral of Gothic design. After Henry VIII imposed the Protestant Reformation, Ireland, under English rule, was required to follow suit. 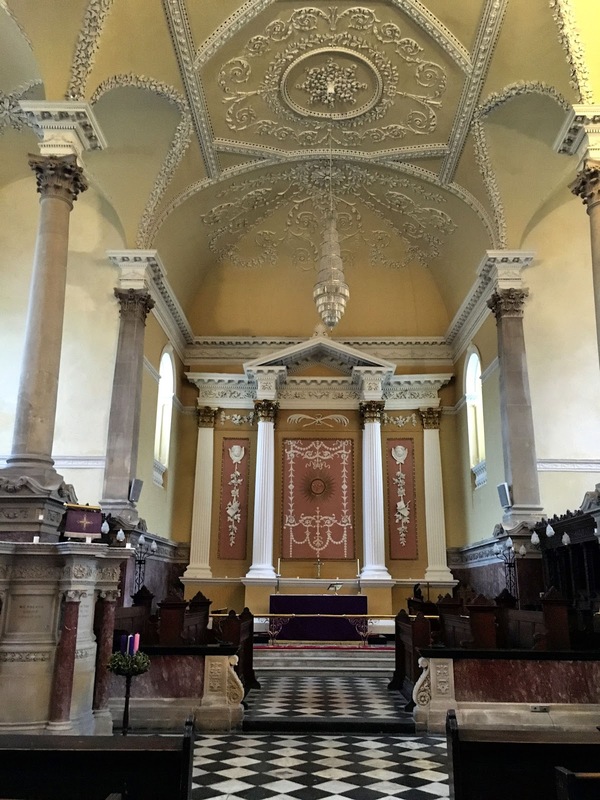 In 1541, the cathedral, like most Roman Catholic church property in the country, was seized by the government for the newly established Church of Ireland, which had been designated the official state church. In 1773, the old cathedral was demolished and a new Georgian style building erected at the behest of city leaders who found the Gothic cathedral too old-fashioned. By 1779, the current building was completed at a cost of £5,397. 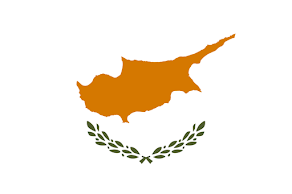 The Neo-Classical style, reminiscent of Ancient Greece, had an elegance that contrasted with the previous Gothic design. The intricate plasterwork on the ceiling was similar to what could be seen in palaces and grand homes of Europe in the 18th century. Back at the crystal factory, we met up with guide Lupeta and a group of a dozen other visitors from nations around the world for the 2:20 tour. As a port city where raw materials could be received and products shipped out, Lupeta explained, Waterford proved the ideal location for George and William Penrose to establish their glass house in 1783. 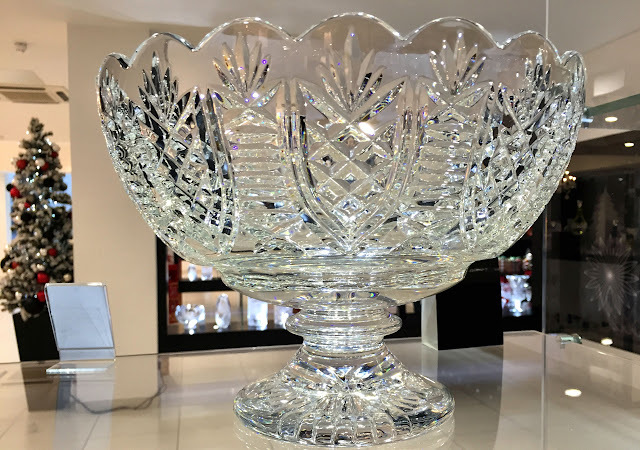 Because the brothers set a high standard of quality and introduced innovations such as polishing crystal items after they were engraved, their products were soon in great demand. By 1851, a steep excise tax imposed on the export of fine crystal forced the factory to close. For almost 100 years, the manufacture of Waterford Crystal lay dormant. 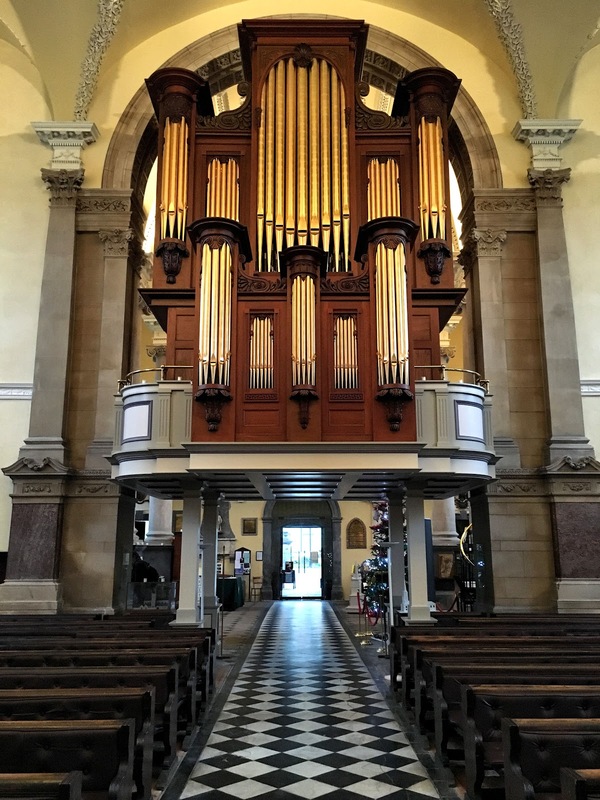 Then in 1947, two Czech artisans, disillusioned with the new Communist government in their homeland, were recruited by Irish craftsmen to come to Waterford and help set up a glass factory. 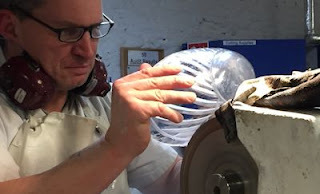 With great respect for the Waterford Crystal tradition of excellence established by the Penrose brothers, the designers for the new factory made a pilgrimage to the National Museum in Dublin to study the old pattern books from the 19th century Waterford glass works. Blending this inspiration with their considerable talents, the new House of Waterford designers created glass with sparkling clarity and deeply cut patterns that produced colorful prisms of refracted light. And people noticed. 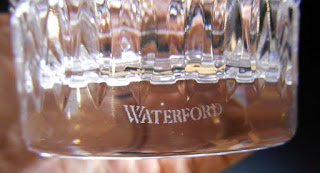 Waterford crystal features deep, precision cuts. 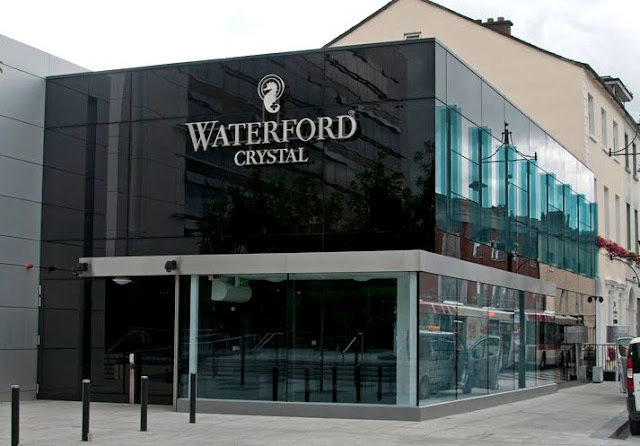 Increasing demand fueled dramatic growth in both size and stature until Waterford became the world's leading brand of fine hand-crafted crystal. In 2010, the company opened a new manufacturing facility and retail outlet in the heart of the city. 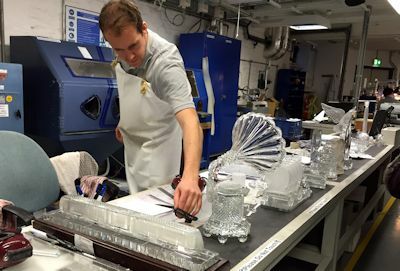 At the plant, glass makers create 70,000 pieces per year—both trophy pieces (unique designs) and production pieces (multiple copies of the same design). On the tour, visitors are afforded close-up looks of the artisans at work and even occasional opportunities to interact with them. Like a piece of crystal, we went through each stage of the manufacturing process. 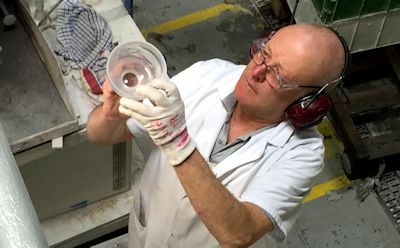 Craftsmen responsible for each step spend years as apprentices on their way to becoming experts in that single aspect of the Waterford operation. 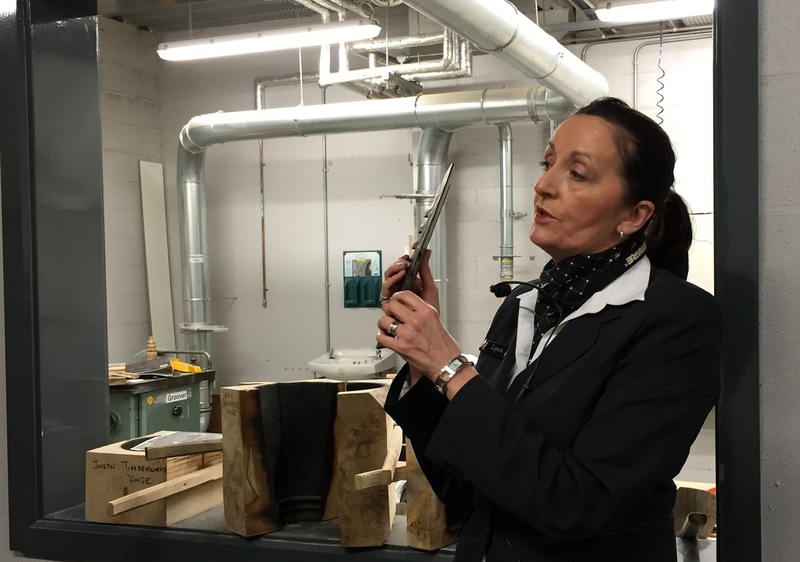 The first craftsmen in the process carve precise wooden molds and hand tools for shaping the molten crystal. Because they are exceptionally smooth and heat-tolerant, pear and beech woods are used. But the molds are not resistant to the fiery liquid and must be replaced after 7 to 10 days of use. 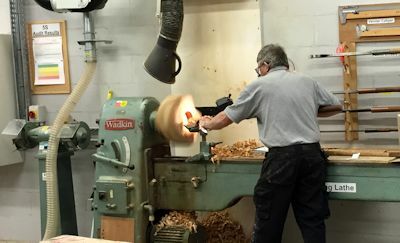 Once a piece leaves the blowers, it is cooled in a very precise manner and sent to the next department for trimming, edge polishing, and its first inspection. 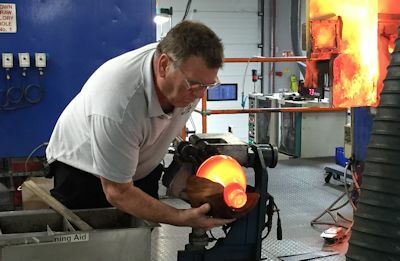 Any piece that doesn't meet the company's exacting standards is tossed into a bin where it will be returned to the furnace to be melted and blended into another batch. 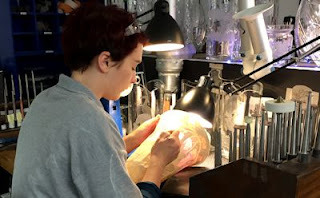 Each piece of crystal that passes the first inspection goes to the hand marking department where it is lined with a precise grid to guide the cutters in creating the pattern for that piece. In the cutting department, diamond-tipped wheels are used for creating the pattern on the glass. Master cutters know just how much pressure is needed to create the proper depth on the cut. Trophy pieces are the dominion of the sculpture department. 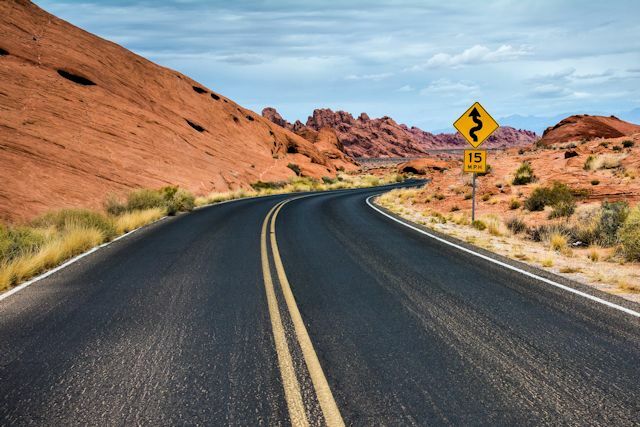 Like the pattern cutters who work on production pieces, sculptors use diamond-tipped wheels in their work. 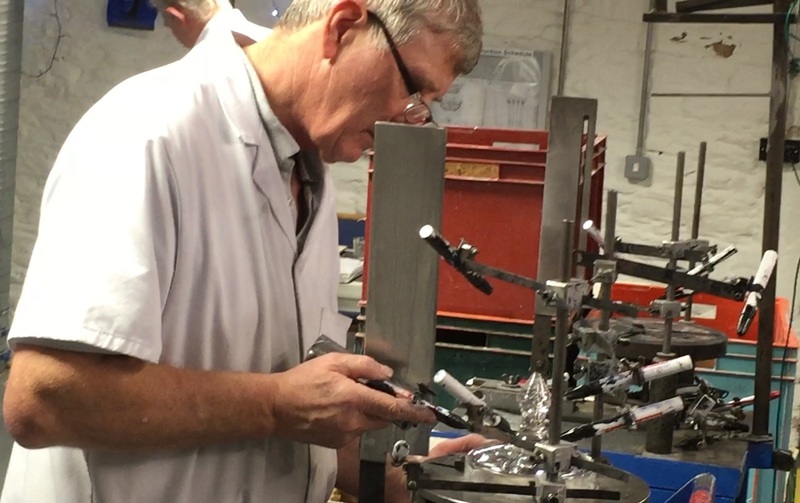 Many trophy creations and some limited edition production pieces pass through the hands of Waterford's engravers, for the addition of either text or images or both. These artisans use both hand tools and copper wheels. Each piece of Waterford crystal bears an etching of the company's name as a mark of authenticity to let buyers know that skilled glassmakers have created and inspected the piece again and again to ensure it meets exacting Waterford standards. And, of course, the tour ends where all tours conclude—in the retail shop where tour participants can purchase their own little piece of glassmaking history to take home or have shipped. 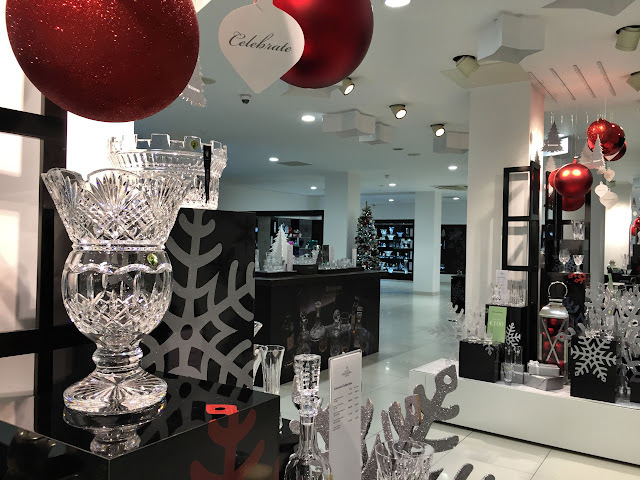 With a selection like this, surely everyone can find some little bauble to remind them of their visit to the House of Waterford. No surprise that the retail shop boasts the world's largest selection of Waterford crystal. Even we, who never purchase souvenirs, were so glassy eyed after the tour that we couldn't resist. 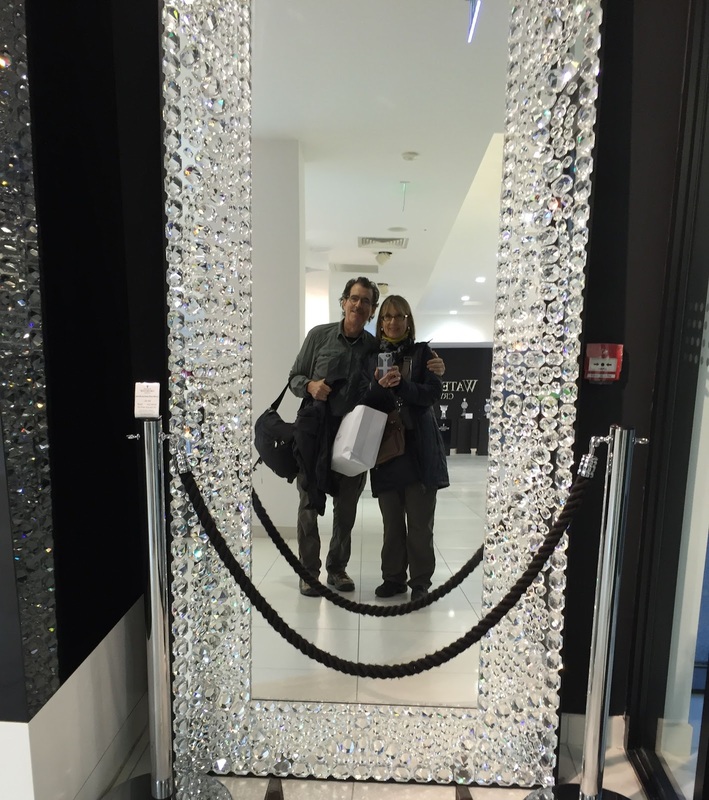 The selfie we took in the shop's crystal framed mirror tells the story. But this little package isn't going into our luggage to travel with us. It's destined to be a little Christmas surprise for someone near and dear who has a clear appreciation for crystal. 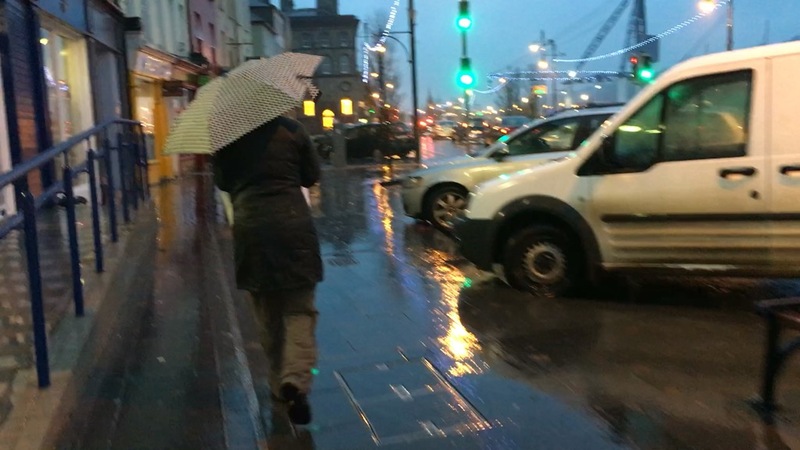 Of course, it wouldn't be Ireland if the rain hadn't been coming down in buckets as we walked the few blocks back to the hotel after our tour. Tomorrow we're planning a zero sightseeing day to catch up on some rest, leaving a few more historical sights to visit on Wednesday before we leave Waterford.